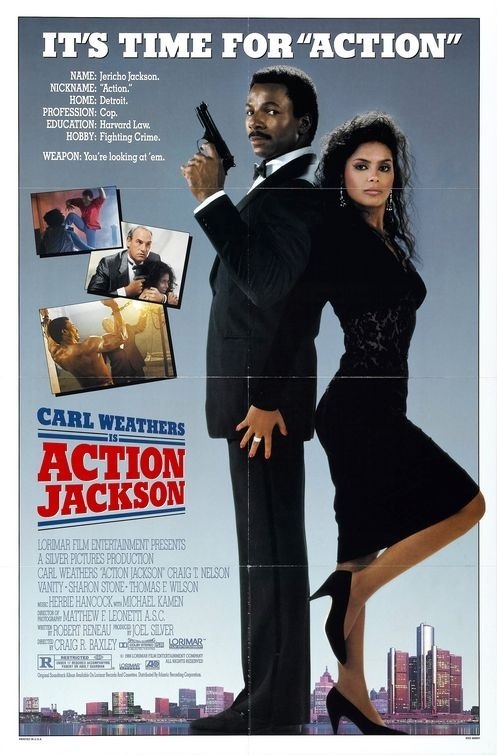 Action Jackson was released in 1988 and I remember seeing the trailer as a kid and wanting to see it since it looked fun and as a huge fan of the Rocky films with Carl Weathers starring in the title role and he was best known for playing Apollo Creed I was even more sold. I vaguely remember renting this on VHS (how retro) and not really liking it very much. After seeing Action Jackson again well over 20-years later I think I liked it even less. Action Jackson is very much the standard action flick of the 80s that we’ve seen millions of times before and a million times since and the only difference is we’ve seen done far better. Despite boasting an excellent cast the film fails at brining much in the way of excitement. Action Jackson was produced by Joel Silver who was involved with some of the very best Hollywood films of the 80s and even into the 90s, but as the decade went on he seemed to lose his touch, but with producing credits on the Lethal Weapon series, 48 Hours, Predator, Die Hard and Demolition Man, Joel Silver is an iconic producer, but Action Jackson is one of his lowlights from his prime. The script written by Robert Reneau is poorly plotted and its quite easy to forget just what the film is all about. Peter Dellaplane (Nelson) is a car manufacturer who is knocking off the local completion while also trying to gain even more power by getting into politics to help elect the next President so he can gain even more power, but hot on his trail is Jericho “Action” Jackson (Weathers) who is also out to clear his name after being set up for murder by Dellaplane. As stated the plot is so weak it’s difficult to remember what the film is all about; if you go back to such franchises as even Lethal Weapon the films were more about the characters interactions than plot and even in some of the Lethal Weapon films you might forget what the main plot was about, but the differences are Lethal Weapon was far better casted and the films by far better written and the strength of the films comes from the subplots. Reneau writes a poor script filled with equally as poor characters that are just cheap knockoffs taken from other films. The one liners are absurd and seem forced and while Reneau attempts at writing a fun and entertaining script, but its devoid of any of that. Craig R. Baxley makes his feature directorial debut as prior to this he directed episodes of the A-Team and after this he mostly made TV movies and TV episodes. Based off Action Jackson its not difficult to see why his feature film career never took off. Action Jackson is sluggishly paced and the action scenes are boring with zero excitement. While from a technical side it’s not a poorly made film, but its lackluster and fails to entertain and makes for one of the weaker action films of the 80s (or any era for that matter). Carl Weathers is entertaining as Action Jackson and seems to be having fun in the role unfortunately he’s given horrible dialogue and silly one liners. But he does the best at what very little he’s given. Craig T. Nelson is a fantastic actor, but the standard 80s villain and he seems to be simply going through the motions with a rather bland and forgettable performance. It’s a shame to see a talented actor like Craig T. Nelson wasted like this. When all is said and done the only reason to watch is for Vanity. Performance wise she’s alright, but failed by her writer and she wasn’t experienced of an actress to make up for her lame dialogue, but she’s smoking hot and her beauty is a bit distracting. She does have a good on screen presence and that with her amazing looks she’s the only reason to keep watching. 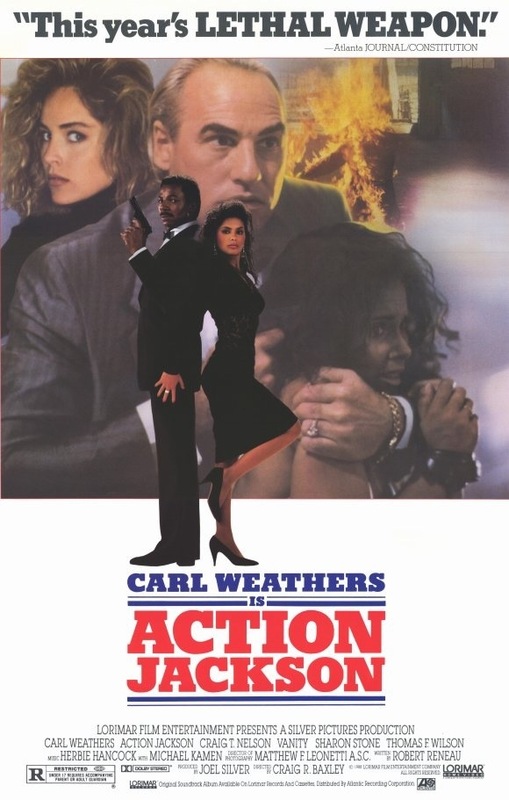 Action Jackson is a semi-forgotten film and its really not difficult to see why and while it has built up a cult following I personally find the film a dud and one of the weakest action films to come out of the 80s. It’s quite unfortunate such as excellent cast is wasted here. Besides Weathers and Nelson, Sharon Stone, Robert Davi and Roger Aaron Brown also appear and that’s just a few as there are many other faces you’re bound to recognize.